So this may be confusing but what was the British Chippy, owned by the English Pork Pie Company, has become Parker’s British Institution! I’ve reviewed the British Chippy (click here for that review). But seeing as they have evolved quite a bit, they deserve a refresh. I’ve recently spent time in England–a good two weeks, both for work and vacation. I had an amazing opportunity to do a food review on a London restaurant (it’s being published in a national magazine, so you will have to wait for that review). However, being over there gave me some perspective on quality British food. The Brits have gotten a bad rap when it comes to their cultural cuisine. Historically known for bland, tasteless, and unimaginative food, English food has scaled the ladder in an upward trajectory–much like Buffalo cuisine has in recent years. While still known for mixing odd pairings together, like the traditional morning ‘fry-up’ that consists of baked beans, fried eggs, a true english muffin, and ham or sausage; England has gotten much better at embracing diverse cultural cuisines. While across the pond, I found that curry is not only everywhere, but the only thing that is truly “take-out.” Much like our fast foods, curry in Britain is considered fast food. And it is good! Indian spices, silky coconut sauces, I was truly impressed. But, and I stress this, do NOT eat it two days in a row! They don’t mess around with their curry, and let’s just say, my stomach was not agreeable to eating it a second time. Another area Britain cuisine has become much better at is in the flavoring department. Bringing top chefs from around the world, and enticing chefs to open more restaurants in England has paved the way for some truly unique dishes. 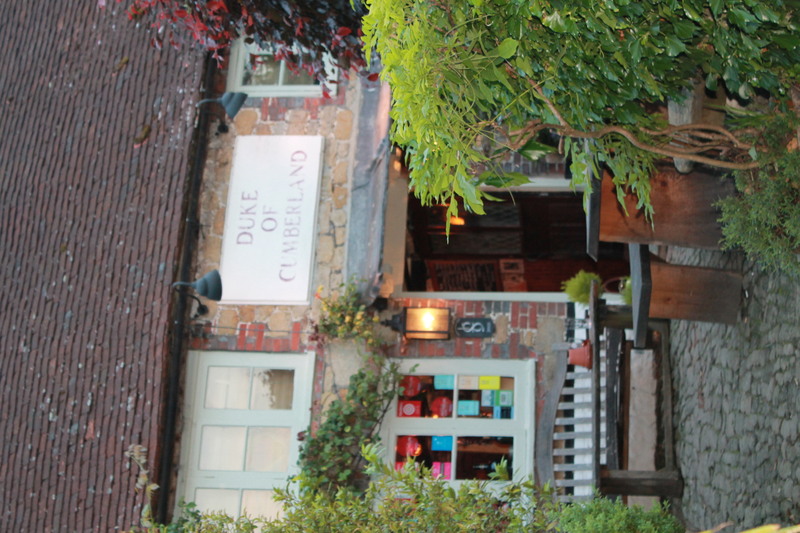 Places like Duke of Cumberland Pub in Chichester, and The Inn at Shipley Pattingham have made a name in recent years based on the success of their now upscale cuisine. Enter British Chippy/English Pork Pie Co./Parker’s in Buffalo, owned by a Yorkshire born husband and wife, Damian and Vicky Parker. Parker’s has grown from the fish and chip shop it started as. The owners of The British Chippy, located at 1176 South Park Ave., now have Parker’s, a hop-skip-and jump just behind at 1216 South Park Ave. While the place is the same (almost), the range of food has widened greatly. This is a store, but what you can order and take home is truly delicious. Take, for example, the Parker’s Pork Pies; made with juicy, seasoned British pork and lamb, golden pork jelly and hot water crust pastry, these savory pies are worth a try. Mushy peas are very popular in England, and so is Parker’s Mushy Pea Pie. A great rainy day comfort food, this pie consists of flaky pastry crust, pork, wheat flour, and mushy split peas. Or go outside your comfort level and try the Scotch Pie. Traditionally a Scottish recipe, this pie is a double-crusted meat pie filled with minced mutton, and also be known as a shell pie or mince pie. Parker’s makes theirs with lamb meat, and is commonly served with gravy. It’s not only good guys–it’s really good! Also available at Parker’s is Fish and Chips (see my previous review); a range of cheeses from red leicester to cheshire cheese; sweets that you can only find in England–mint humbugs, rhubarb custards, jelly babies, and coconut mushrooms. Picture Harry Potter tucking into a bag of sweets in the English countryside and those are the candies I’m speaking of. Parker’s also offers hampers for gift baskets, bakery items and traditional English meats from their butcher section. If you want to get a sense of what revamped, traditional British food tastes like, Parker’s is a great introduction into the world of British cuisine. **Update–For those of you who would like to experience a bit of British culture without the store experience, Parker’s has a small sit down eatery behind the store front called Parker’s Pitch Bar. 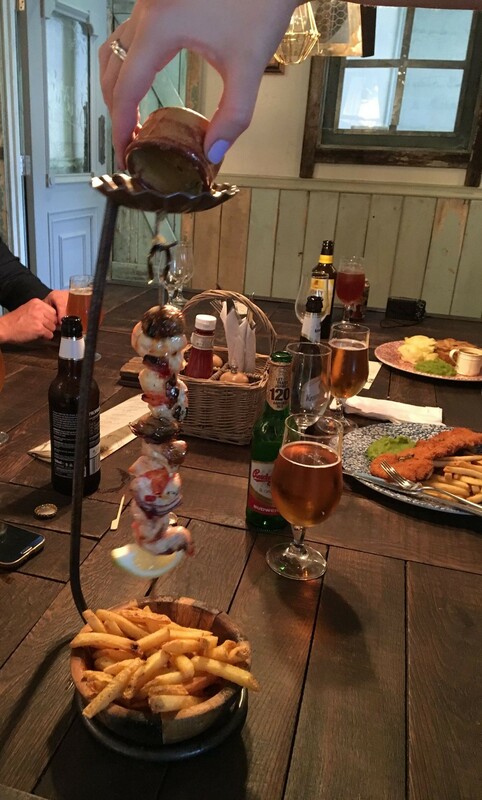 With a soccer field for a view–known in Britain as a pitch, you may sit at a table or the bar and order some of Parker’s unique cuisine. However, the menu is small and their feature pie’s change weekly. But you can still order frozen pies from their store options and take them home. Along with traditional cask ales, and ginger beers (non-alcoholic), soccer matches are played regularly on the pitch along with European matches aired on television. While small and bit too industrial, it does offer a sit down option for those interested in more of a pub or restaurant feel.